HomePoliticsIf PM MODI AND SHAH TO TOUR THE RAJASTHAN FINAL, WILL EMERGE FROM NOVEMBER 23 Is So Terrible, Why Don't Statistics Show It? BJP is preparing a full-proof plan to achieve the victory in the elections. With the election to reach the peak, the party's largest star campaigner PM Narendra Modi and Chanakya of the party Amit Shah will start roaming in the state. Under the special tactic of the party, Modi and Shah have visited Rajasthan in the last 15 days before voting. 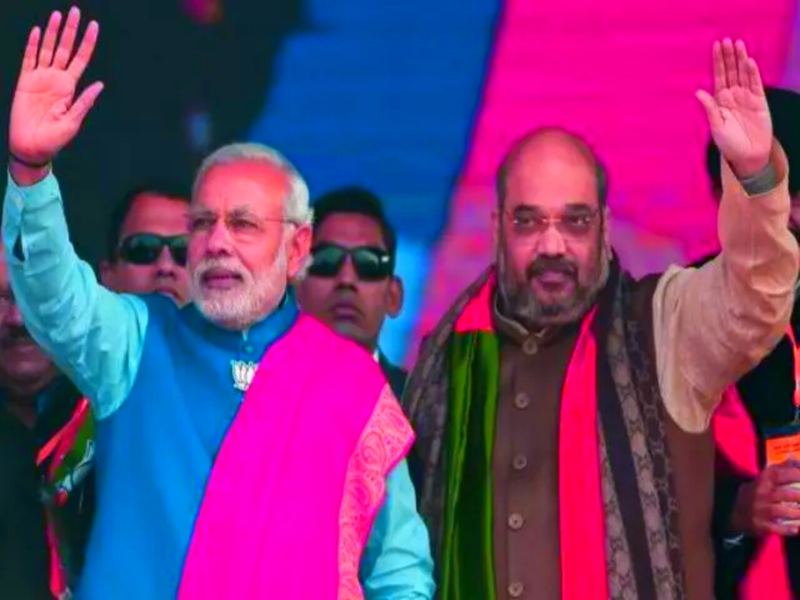 Within 15 days, the tornado of Modi and Shah will reach 22 districts of the state. The tour of both will start from November 23 and ends on December 5. Modi will hold 10 meetings in Rajasthan, while Shah will hold 12 meetings. Party sources said that it has been decided to make Modi's meetings in those parts of Rajasthan, where the situation remains weak. Similarly, Amit Shah will also organize meetings till the assembly level and make the road to victory between the challenges faced by the party. Sources said that earlier, the party would hand over election to MP and Chhattisgarh. So that the entire focus from the state to the Delhi till one fortnight of the last remains in Rajasthan. High sources of the party say that according to the plan prepared, Modi and Shah will not share the platform together. They will cover more and more seats while meeting in different places. So that the ground situation of the party can be strengthened. PM Modi will cover the seats where the party's position is more pronounced. Similarly, Shah will also make road shows along with meetings in weak seats. It is being told that the consent of the central leadership has also been received on the scheme prepared by the BJP. At the same time, the top leadership has asked Chief Minister Vasundhara Raje to do more and more election meetings. This time the central leadership has suggested to do Vasundhara for nearly 100 meetings. Right now, this time PM Modi's rally will be less than the last elections. Modi had 21 rallies in the last elections, while this number is half this time. But, after this, the state leaders are excited about the meetings of Modi and Shah. Let us tell you that maintaining power in Rajasthan remains the biggest challenge for the BJP. Anti incumbency against the state government remains. During the survey conducted by the party and the feedback taken, people's displeasure has been seen in most of the seats. At the same time, the resentment of the workers against the existing legislators remains. From above, there is a negative atmosphere about the functioning of CM Vasundhara Raje. On the other hand, Congress is continuously attacking aggressively. Party sources say that PM Narendra Modi can organize meetings in places like Hanumangarh, Sikar, Nagaur, Alwar, Jaipur, Dausa, Bhilwara Kota etc. in the state. Their rallies will begin on November 23. Under this, there may be between 2 and 3 rallies on some other day. Party level internal preparations have begun. Let us tell you that where the places where Modi will perform rallies, the party which is standing as a third front with the Congress for the party, is also slowly making the challenge. The sources said that the party's Chanakya Shah Phalodi, Barmer , Jalore, Sirohi, Dungarpur, Dig-kumher, Karauli, Sawimadhophopar, Nawalgarh, Sujangarh and many other places. During this meeting, Shah will make the party's way easier with thundering on opponents. Of these, Barmer's meeting can be attractive. Sources said that Shah, along with his meeting, will also understand the situation of the respective seats and also create necessary strategies.